How to actually make change. Wendy Hodge, Health and fitness for women at midlife and beyond. Let’s Start With How You Think …..
Research says that a large percentage of people attempting to lose weight on their own fail, but that’s not because the overall process is too difficult. The biggest reason most people fail is because they try to change everything at once — the “all or nothing” approach. Not to mention the fact that “diets” don’t work in the long term, because they’re simply not sustainable in the long term. What should you do instead? Try changing just one or two habits at a time. This does require patience, along with changing the way you think about weight loss. It also means you’ll get to your goal more slowly than you’d probably like to, but let me tell you why that’s a good thing! You’ll have a much higher chance of reaching your goal instead of failing over and over — and I know which one I’d prefer, how about you? The most important change, though, has to occur in your mindset. 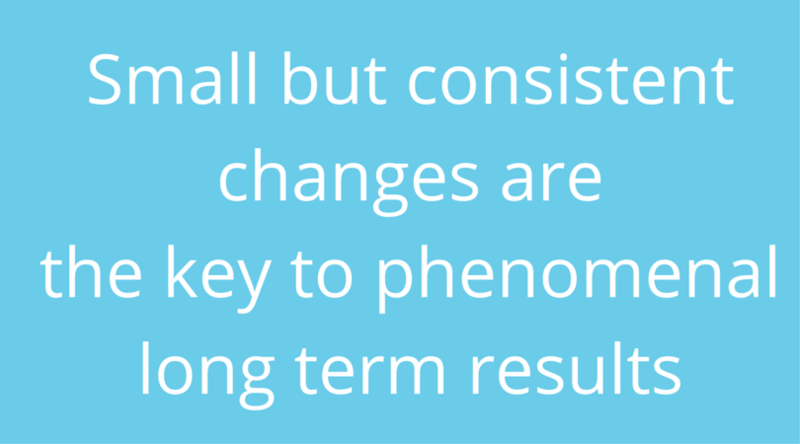 Forget thinking about change as short-term or temporary. Forget thinking about deprivation and sacrifices. You’ll never lose weight and keep it off until you permanently change your diet, (and your lifestyle), one habit at a time. That’s a simple fact. I’m not saying that it’s easy to do, but it’s the truth. Just ask anyone who’s fit and healthy — they maintain it by living a healthy lifestyle. And they’ll tell you that it took time to discover what works best for them, because everyone’s different. That it’s not always easy. That it does take effort. That you will have slip-ups because you’re human and perfection is a myth. That ultimately, they choose a healthy lifestyle, because it’s better than the alternative. It’s about choosing compromise over excess or extremes. Deciding that you want look after yourself — and take responsibility for your health and wellbeing. JUST. LIKE. THAT. So it’s up to you. Do you really want to continue jumping from diet to diet, with each new popular fad? Or is it time to start making some real changes? The choice is yours. No, it’s not easy, but the rewards are amazing! Listed below are ten simple healthy habits that you can easily implement into your daily routine. You only need to choose one — change needs to be slow and steady to be successful, remember. Choose one that you think you can easily do every day for the next two weeks. Ask yourself: on a scale of 1–10, how confident am I that I can do this every day for the next 14 days? Be honest with yourself, your answer should be a 9 or 10. If it’s less than a 9 then either choose a different habit, or modify it until you’re confident that you can easily do it everyday. I’d love to know if you decide to give it a go, so drop me a line [email protected] and let me know! Originally published at wendyswaytohealth.com on October 23, 2015.